We’re lucky! 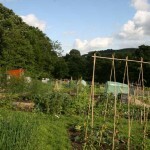 We have two allotment sites being worked in New Mills. The Society supports members in pursuit of their gardening activities fostering an awareness of the benefits of growing and eating fresh vegetables. Membership is open to any local resident who is interested in gardening, even if they do not wish to rent an allotment. Our sites are off Ollersett Avenue and in a former paddock in Hague Bar. The Ollersett Avenue site was set up in 2005 and has 31 plots. The Hague Bar site was set up in 2010 and has 23 plots. We have a waiting list for both sites, but if you wish to be added to the list please contact the society. Please see our gallery for photos of the sites and our magazine section to view copies of our newsletters.